Add a touch of whimsy and joy to your next concert with this new young band work. 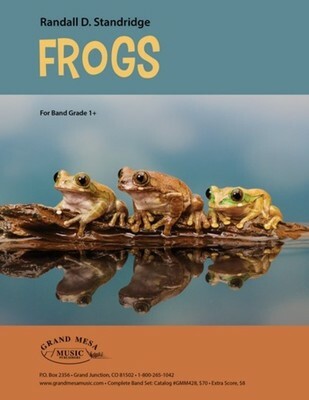 Inspired by the composer's love of Percy Grainger, Frogs combines many "Grainger-isms" (unexpected harmonic movement, chromaticism, and a pastoral sensibility) with quirky percussion and accessible rhythms and ranges to create a truly unique work for young band. The inclusion of the "Frog" and optional sound FX add the final points of charm to this new work, destined to be a hit with students and audiences alike.